Price FP-875 is £3.95, while FP 876 is £3.45. This set is that chosen from 1947 time period and is still in use for some applications today on those aircraft where the need for low-viz markings are not really needed. 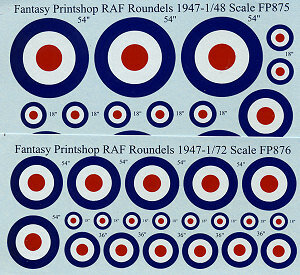 Fantasy Printshop has these decals in the two major scales. FP876 is 1/72 and FP 875 is 1/48. There are three major sizes on each sheet: 18 inch, 36 inch, and 54 inch. The printing is first rate and shows no registration problems.